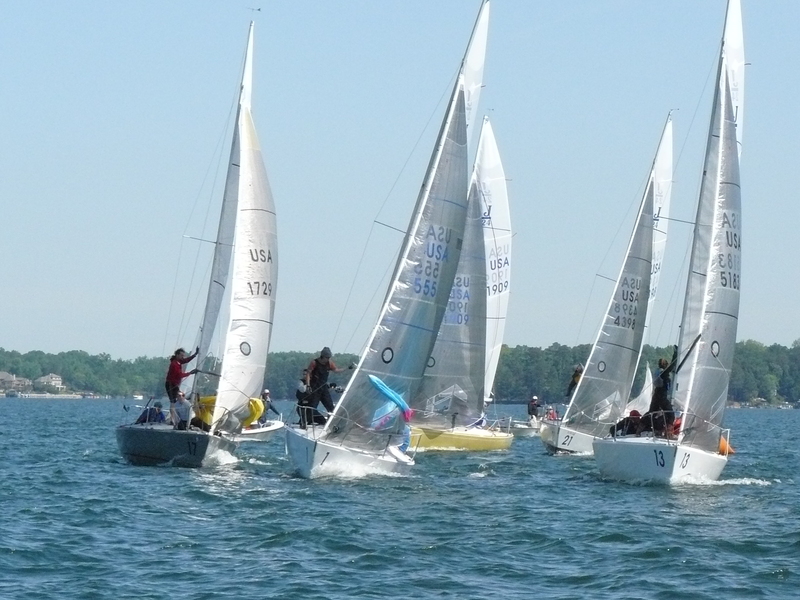 The tradition of great southern hospitality and great weather continued at the J/24 Easter Regatta in Columbia, South Carolina. Good Friday saw a northerly blowing between 8 and 15kts over Lake Murray dam. Sporting large puffs and shifts and sunny skies it was a perfect day of racing with 4 worlds length courses. Winning race one was Travis Odenbach after a close battle with Tony Parker to the finish. Race two the wind picked up to strong whitecaps and Ron Medlin owned the left side to lead the pack. After a bit of a slow start it was last year’s winner, Peter Bream who won the last two races. The third was a battle between Mike Ingham and Bream all the way to the finish. Peter won race 4 going away. After day one, Ingham and Parker were tied for the lead with Bream 7 points behind. Odenbach and Dave Van Cleef rounded out the top 5. As always, Columbia sailing club put on a great dinner Friday night and the party moved to Billy Rae’s barn setting up for some sore heads on Saturday. Day 2 was a perfect sunny day –except there was no wind. There was a “fun race” with jib only, few rules and a really short course in front of the club where a really local thermal held up long enough to declare Patrick Wilson the winner. Several real races were attempted in the afternoon but with the lack of wind the committee mercifully called it off so the results remained unchanged from Friday. Day 3 brought a nice south breeze at about 13kts which held long enough to complete three more races. But first we should recap the Easter-Eve events. It started of course with the beer truck and Ultimate 20 fleet’s rum punch machine. Dinner was the traditional southern spread of pulled pork, chicken and beans. Then great fun was had as local Roger Dougal hosted the annual “beer slide”. Then some dancing and the traditional after hours at Billy Rae’s barn went strong. So after all the night’s festivities, it was great to wake up to the trees rustling with solid wind. The scores were close between the teams of Parker, Ingham, Odenbach and Bream. So of those four, it was set up such that whoever won the day would probably take the regatta win. Odenbach got to the top mark first in the first race, with Ingham close behind. But in the end Ingham got past for the race win and Odenbach fell to third. Both Parker and Bream were a bit deeper. John Heaton had a great race finishing second. Race two was still from the south but it was a bit lighter at maybe 6kts.Parker took the lead on the second beat and held on for the win. Race three started in sub 5kts and was left shore favored. It was set up to be a 5 leg course but the breeze got very light as the fleet approached the first gate. This is where it got fun as the boats behind closed in on the leaders who hit the no wind zone first. As the fleet compressed from behind and drifted toward the gate, the RC mercifully shortened course. But that did not stop the carnage as just about the entire fleet compressed for photo finish between the leeward gate marks. In the end it was John Heaton who took the win, followed by local standoust Roger Dougal and Hootie Bushardt. As always, Columbia Sailing Club put on a great show, thanks to this year’s chair Charles Bumgardner and his cast of many volunteers. 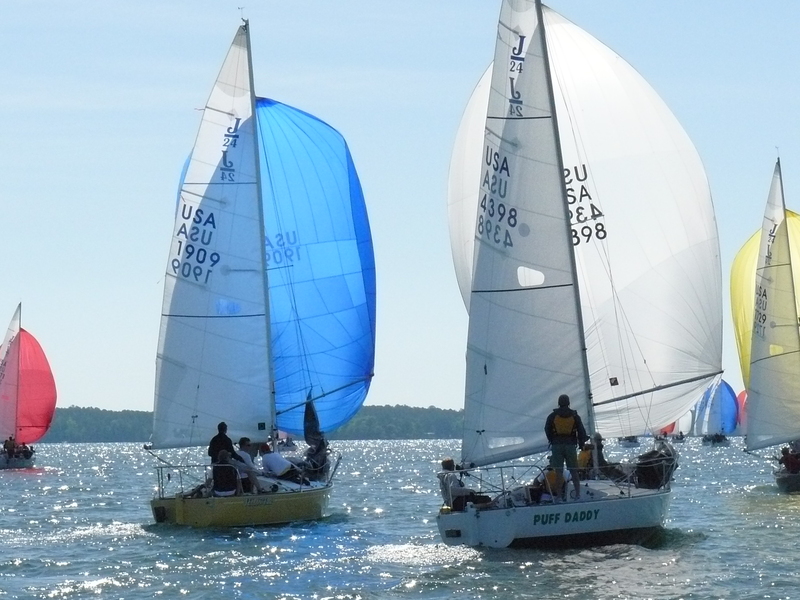 View regatta photos here courtesy of Joe Reyes.